McLarty Daniel Chrysler Dodge Jeep Ram Fiat in Springdale, Arkansas has a 2018 Jeep Compass for sale. The world over, one word has become synonymous with reliability, toughness, classic design and unstoppable off-road capability. That word is: Jeep. With a reputation like that, you’d better believe that the engineers and designers behind the brand bring their A-game when it comes time to create a member of the Jeep family of vehicles, and with the 2018 Jeep Compass, they’ve built a SUV that’s definitely worthy of the nameplate! 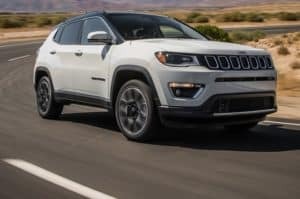 Legendary Jeep Design: From any angle, the 2018 Jeep Compass is all Jeep, from the classic seven-slot grille that harkens back to the brand’s beginnings on the battlefields of World War II, to the sleek and fluid lines of the rear hatch. With a bold, muscular style that evokes that of the latest Jeep Grand Cherokee, only in a smaller package, the 2018 Jeep Compass speaks of its on- and off-road prowess from any angle, with details like available two-tone paint schemes, tasteful polished aluminum trim around the windows, fog-lamp pockets, and grille openings, and the trapezoidal wheel arches that are also a classic throwback to the original Willys Jeep. Inside, the 2018 Jeep Compass can be just a cushy or no-nonsense as you want it, with available leather, power seats, and room for five. Legendary Jeep Technology: Keeping you and your passengers safe is the most important thing your vehicle does, and the 2018 Jeep Compass is always working behind the scenes to make sure you get to your destination on time and in one piece. Accomplishing that are seven advanced airbags, plus over a dozen other safety systems, including LaneSense lane departure alert with Lane Keep assist, active braking with forward collision warning, and blind spot monitoring to keep an eye on the other guy. With you and your passengers safe and sound, the job of keeping you connected and entertained falls to the available Uconnect 8.4 inch in-dash touchscreen, which includes features like Bluetooth Audio Streaming, hands free calling, turn-by-turn navigation, smartphone connectivity via Apple CarPlay and Android Auto, and more. Legendary Jeep Capability: Say the word “Jeep” to almost anyone, and the first thing that comes to mind is unbeatable off-road performance. Properly equipped, 4×4 models of the 2018 Jeep Compass live up to that great reputation with a 4LO crawl ratio of 20 to 1, and advanced door and electrical sealing that allow your new 2018 Compass to cross streams up to 19 inches deep. Ground clearance of 8.5 inches, plus short front and rear overhangs allow you to crawl up and over obstacles that would stop other SUVs in their tracks, while class-leading front suspension articulation helps keep your wheels planted and driving you forward, even in uneven terrain. Powering you through under the hood is the 2.4-Liter Tigershark Multi-Air 2 four cylinder, which delivers up to 2,000 pounds of towing capacity by putting out 180 hp and 175 lb.-ft. of torque. We’ve only really scratched the surface here of all the things that make the 2018 Jeep Compass one of the most capable, most reliable, toughest Jeeps ever built. Knowing all that, isn’t it clear that today should be the day you join the thousands of owners who rely on their 2018 Jeep Compass to carry them through, in town, off-road, or on the highway? Stop in today at McLarty Daniel CDJRF in Springdale for a test drive, and let your new Compass point the way to adventure. 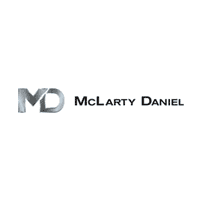 McLarty Daniel CDJRF of Springdale is a new and used car dealership selling Chrysler, Dodge, Jeep, Ram and Fiat vehicles. We’re proud to serve Northwest Arkansas, including the cities of Bentonville, Siloam Springs, Rogers, Eureka Springs, Springdale, Bella Vista, Rogers, Fayetteville and all points in between.